General Description of TCR beta. 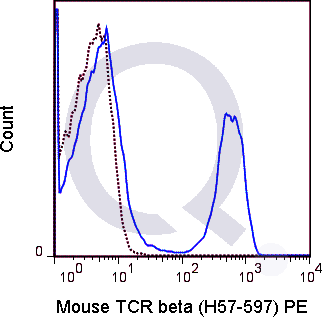 The H57-597 antibody is specific for the beta chain of the mouse T cell Receptor (TCR). 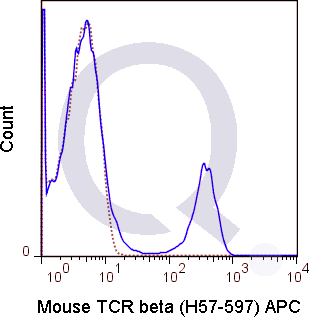 This cell surface protein combines with a second protein chain (alpha chain) to form the alpha-beta TCR that is expressed by NK1.1+ thymocytes, NKT cells, and the majority of peripheral T cells. 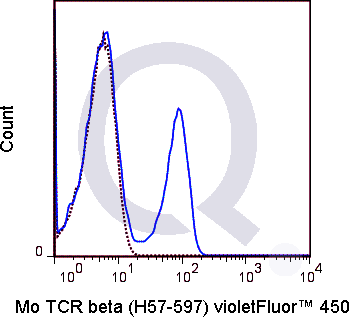 A small number of T cells may express an alternative heteromer of gamma/delta protein chains, known as the g/d TCR. These receptors participate in a complex with CD3, and with the co-receptors CD4 or CD8, to recognize and respond to antigens bound to MHC molecules on antigen-presenting cells. 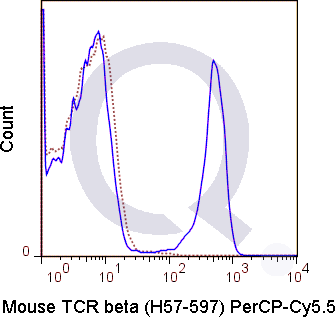 Such interactions promote T cell receptor signaling (T cell activation) and can result in a number of cellular responses including proliferation, differentiation, production of cytokines or activation-induced cell death.The H57-597 antibody is used as a phenotypic marker for T cells expressing the alpha-beta TCR. It is also widely used to cross-link surface TCR and thereby mimic TCR-mediated cell activation or induction of apoptosis. 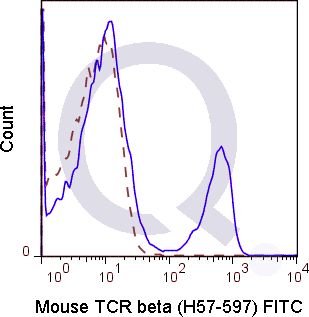 The antibody does not cross-react with cells expressing the g/d TCR. 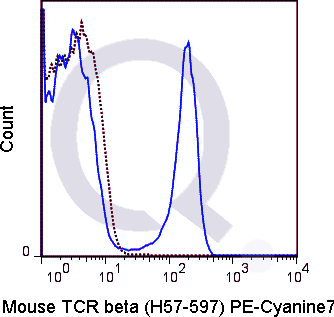 enQuire Bio's Mouse Anti-TCR beta Monoclonal is available for Research Use Only. This antibody is guaranteed to work for a period of two years when properly stored.